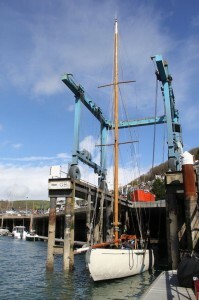 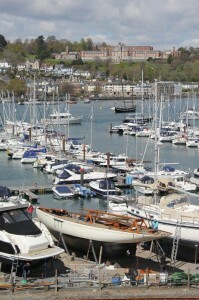 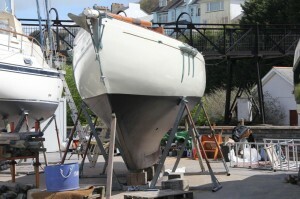 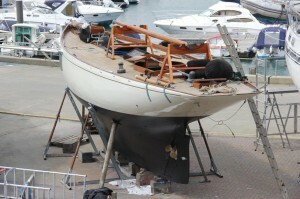 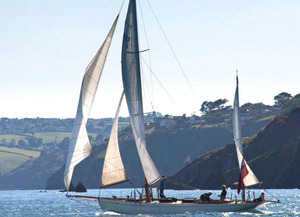 Since 2017 Saunterer’s news has appeared increasingly on her Facebook page – which is found at https://www.facebook.com/Sauntererclassicyacht/ – do follow the link to see these news items. 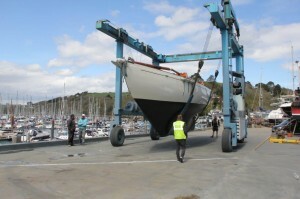 After almost exactly a year on dry land, Saunterer was relaunched on 28 April 2016 – and returned to the Solent from Weymouth in the afternoon of Monday, 16th May 2016 and returned to her home on the Beaulieu River. 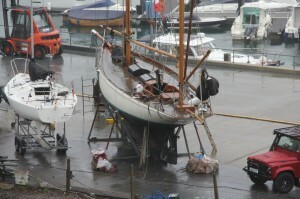 Saunterer is once again ready for sea! 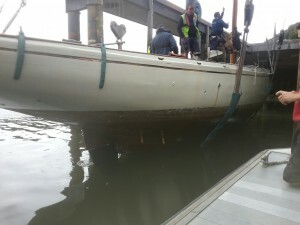 Saunterer is ready once again to go to sea! 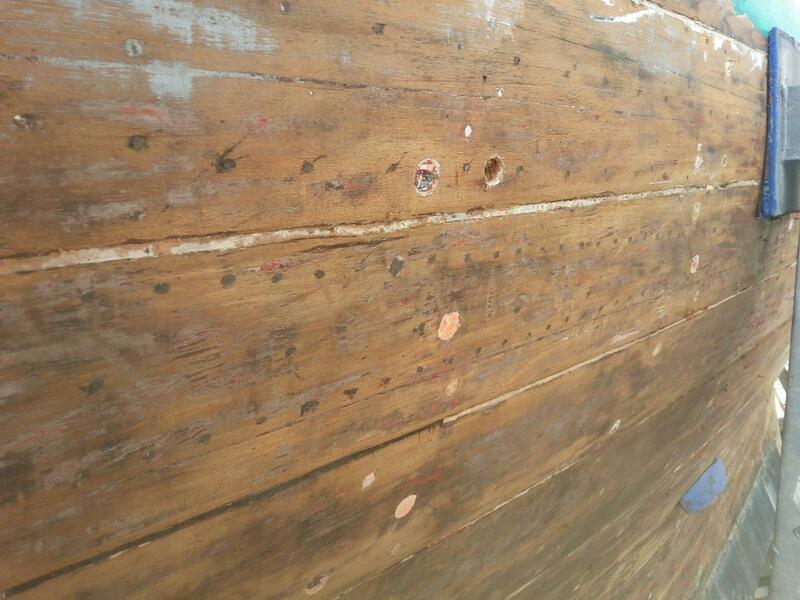 The picture above compares to her portrait in April 2015 in the same position before all the work was carried out – at the beginning of this uncertain and vital restoration journey. 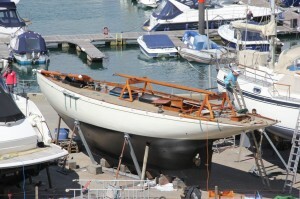 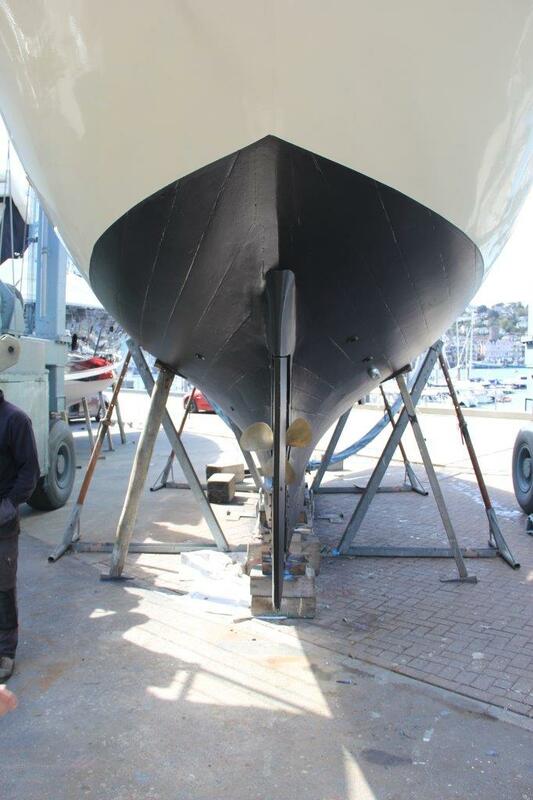 The final preparations are made before her relaunch on 28 April 2016. 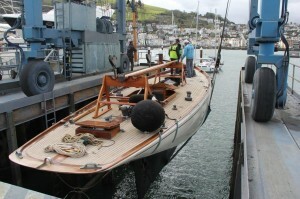 Thanks to Guy Savage and all the team for the hard work over months to bring her to this point! 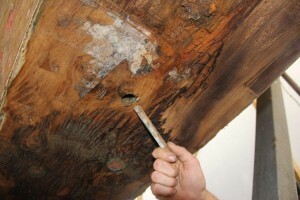 The final stage of analysing the extent of the restoration work yet to be done is to examine the elm keel – which we believe has not seen daylight since 1900. In the shelter of the tent now built over the hull, with the ballast keel removed, the wooden keel is drying out and open to the air for the first time in a century. 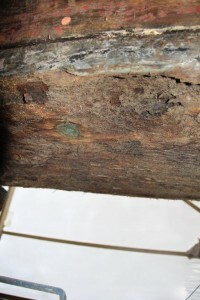 Reflecting the quality of the materials available to Charles Sibbick and the Albert Yard in the winter of 1899 and spring of 1900, this piece of wood is in the most extraordinarily good condition – while the surface is marked and rough in places, we have found almost no damage and this huge single piece of elm in an overall excellent state. 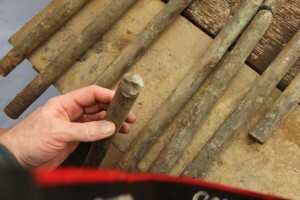 This is an important conclusion and a major discovery – and reveals the final extent of the work required to complete this phase of Saunterer’s most far reaching restoration. 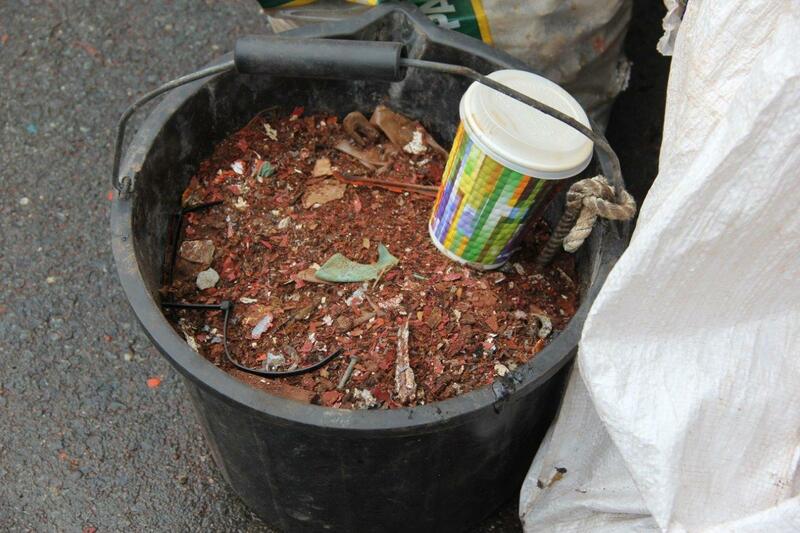 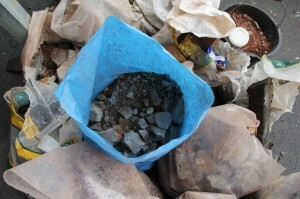 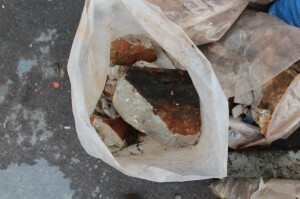 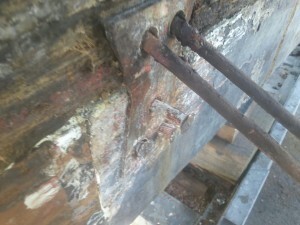 Breathing a sigh of relief we can also now begin more accurately to assess the programme of rebuilding. 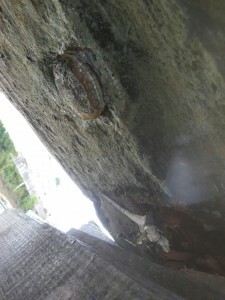 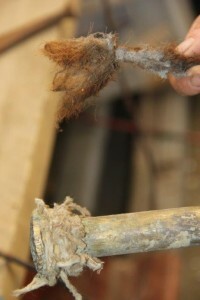 The picture below also shows the bolts fastening the teak keelson to the elm keel – we think these are good and in their original condition – so these we are not disturbing these as they are fast (see Saunterer gives up her secrets – Part 2 for the description of the conclusions about her construction in this area). 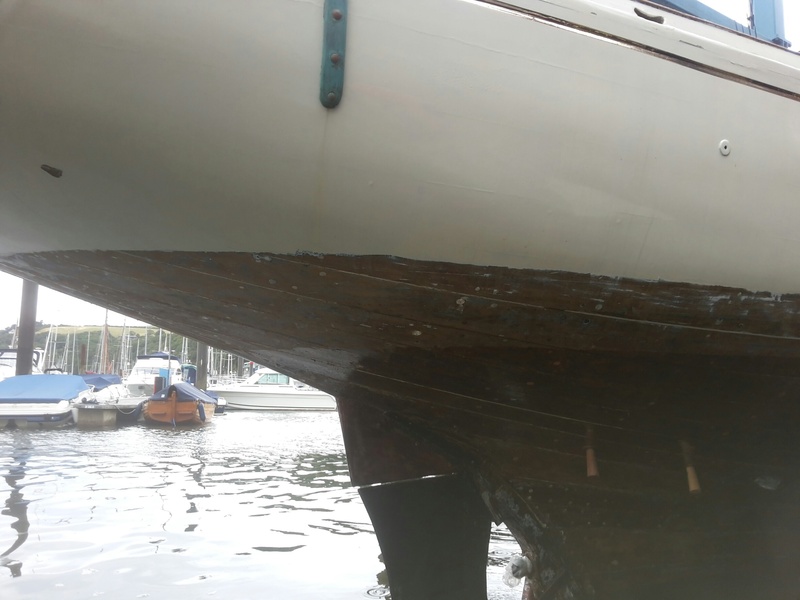 The plan from here will be to fair the elm keel, seal it with epoxy, and make it smooth for receiving the ballast keel back again in due course. The picture below shows the early marks of a plane as this process begins – it is at a very awkward angle requiring great agility from the team! 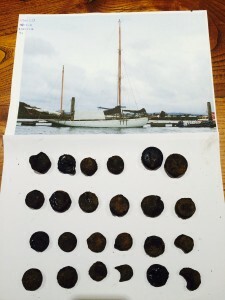 The Project Team – October 2015. 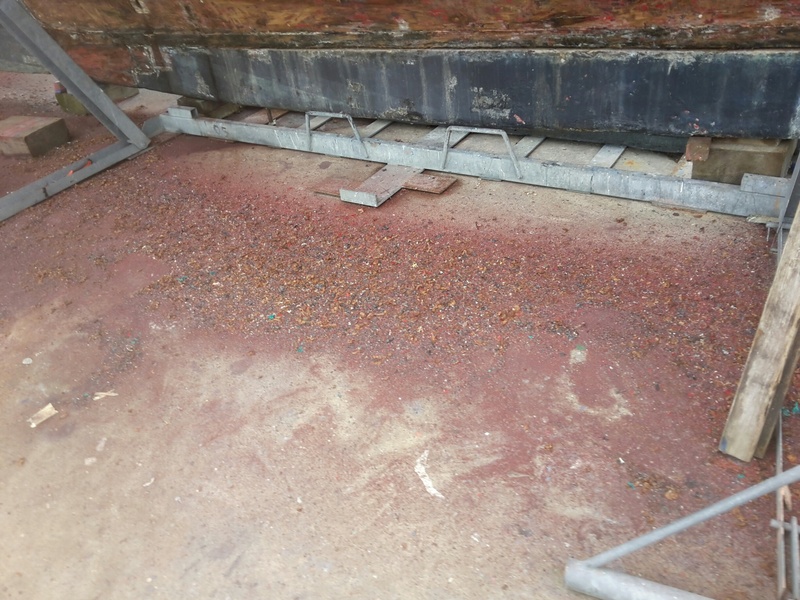 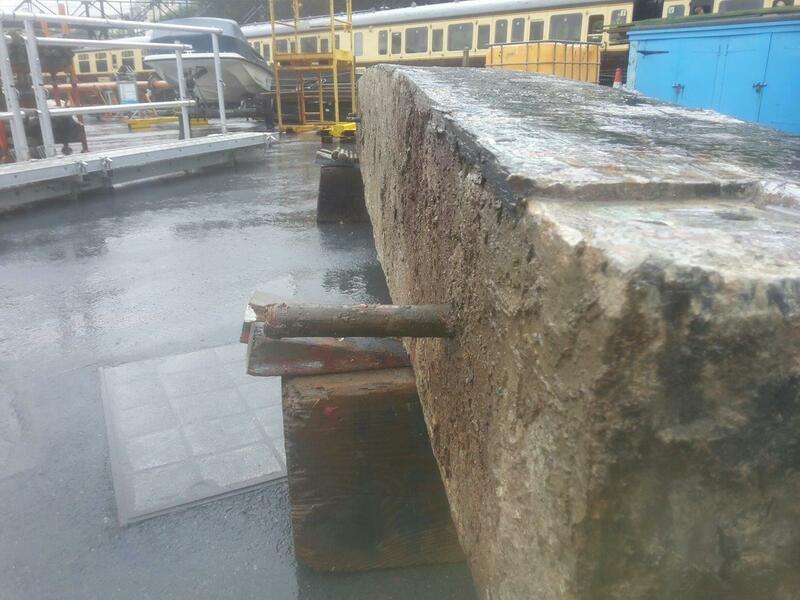 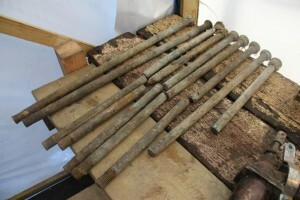 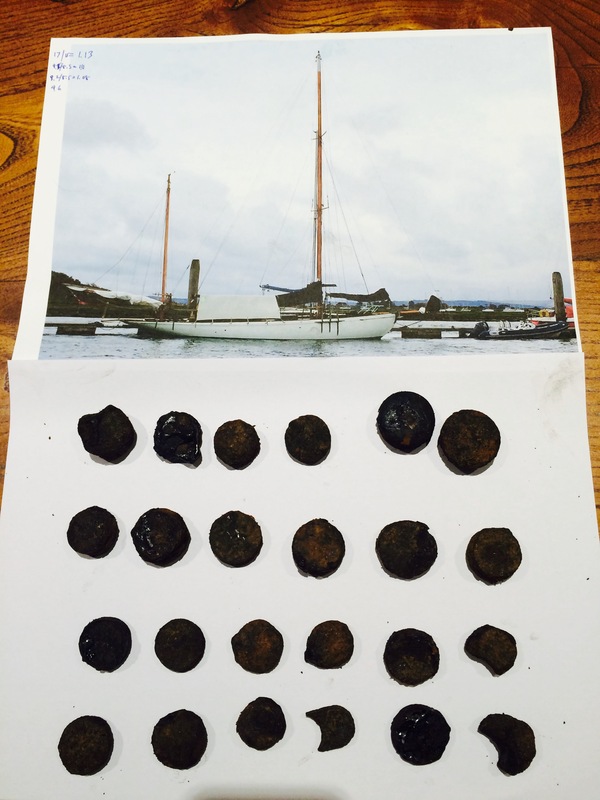 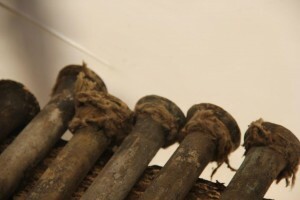 The picture below shows 9 keel bolts on the workbench after their removal from the ballast keel – out of the 10 bolts that fastened the lead ballast keel onto the elm keel running along the deepest part of the hull. 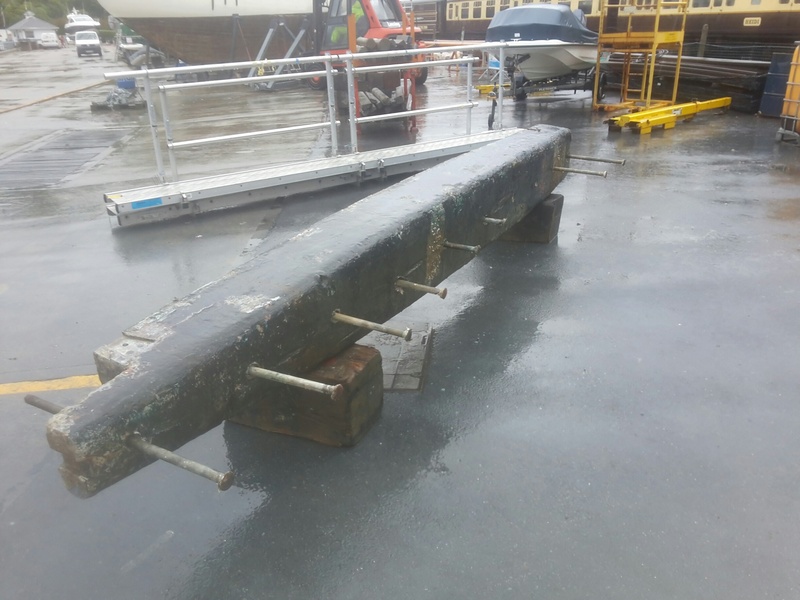 Two are intact, and at least three broke on removal – which means that some (perhaps a third) had given way in situ which might have resulted in some flex in the ballast keel when healed over – putting greater strain on the remaining bolts. 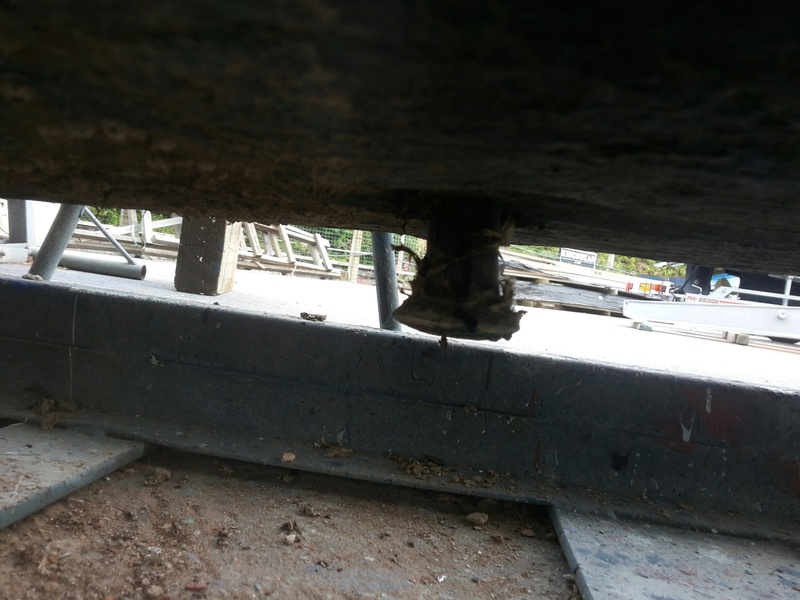 The picture below shows the condition of a broken section of a keel bolt, where the process of oxidisation has weakened the metal to the point where is loses its strength and breaks. 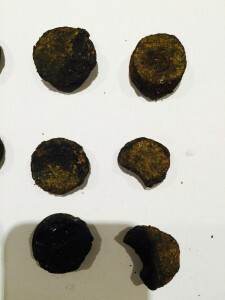 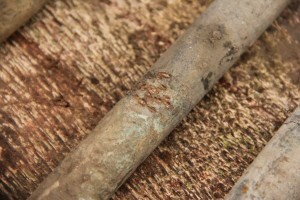 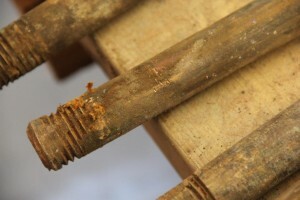 The two pictures below illustrate how soft the oxidised middle section of the bronze bolt is – as it easily marked by light blows from a hammer, while the bolt ends are noticeably harder showing smaller marks from the same impact. 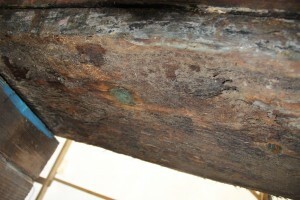 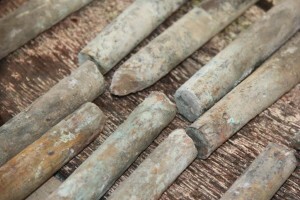 The process of bronze oxidisation takes many decades – and while it is thought from records that some of the bolts were drawn and tested in the 1970s (when Saunterer was last listed as Lloyds A1) we think that some of the keel bolts may never have been removed at all since launch in 1900 due to various reasons, and this view may be supported by the fixing round the bolt heads shown the picture below which was we believe typical of the period when Saunterer was launched. 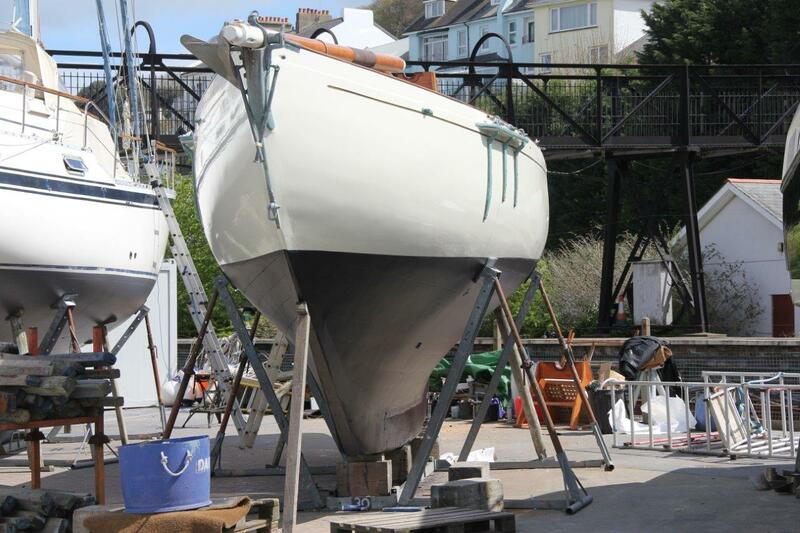 The “bottom line” is that this part of her restoration was, as we thought, a necessary and vital exercise, and may as it happens have been done at exactly the right time – later could have been too late. 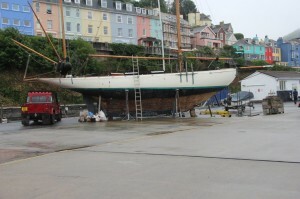 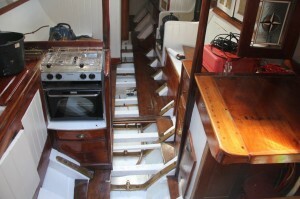 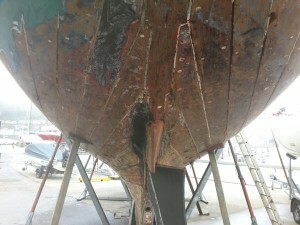 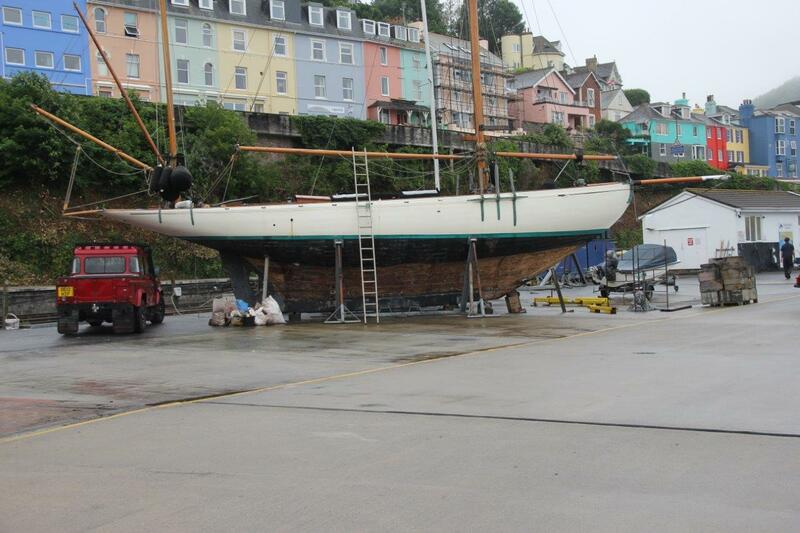 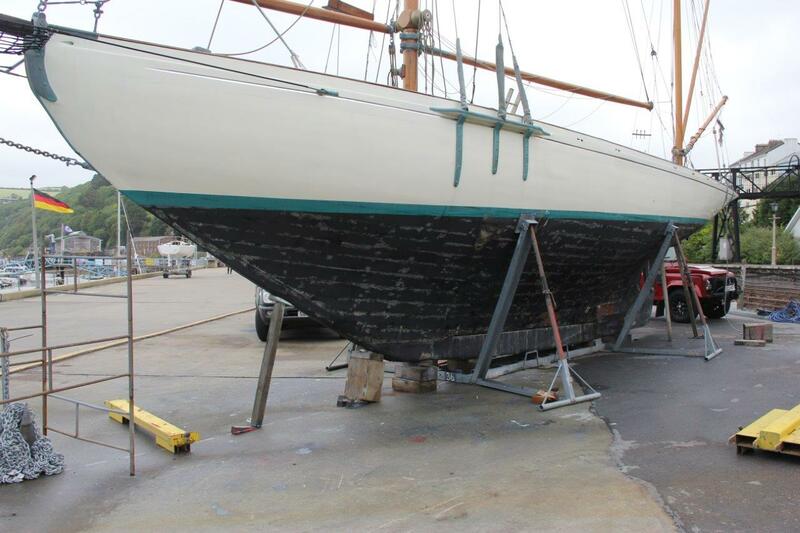 “The process involved in removing Saunterer’s ballast keel has required much thought. 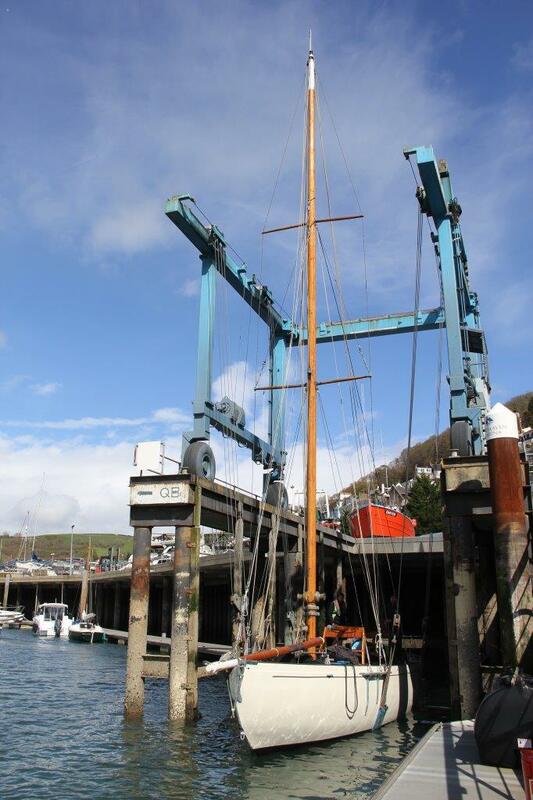 The overall weight of Saunterer with all her equipment is some 16 tonnes, and we now know that the ballast keel weighs 8 tonnes. Consideration has to be given to how to achieve this – not only finding facilities and skills to carefully lift her clear of the ballast keel, but also to think through the effect of removing the ballast keel on the stability of the vessel on the hard, and also on her structure – so that she does not bend when it is not in place. 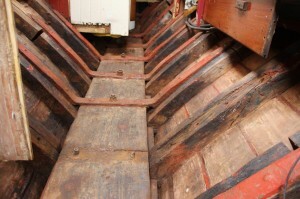 Having taken all this into account, the keel bolts are loosened – the keelbolt nuts at the upper end, and melting the tar which was usually placed around the lower end, it was a matter of patiently and gently easing them out. 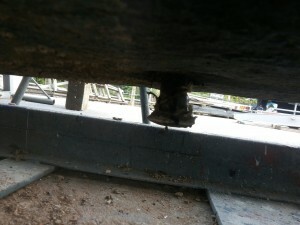 We did not wish to disturb Saunterer’s timbers with the major impact of driving the bolts out. This picture (at an angle to show the light) shows the lower end (the head) of a keel bolt moving clear of the ballast keel – we think for the first time in 115 years! 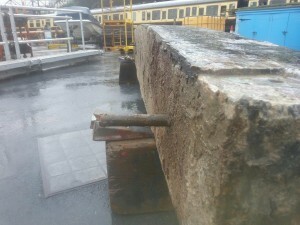 The same treatment was given to the bolts which traverse the hull through the butterly plates at the fore and aft ends of the ballast keel. Once all the bolts are clear, the crane can return and Saunterer can be lifted clear of the ballast keel, and set down again on her cradle – and the keel itself can be turned on to its side separate from the hull so it can be prepared for refastening to the hull in 2016. 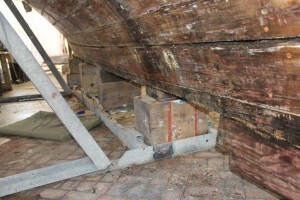 The pictures above show (left) the entire ballast keel with some of the 10 keel bolts still in position, and (right) the top of the keel where it joins the hull – this surface will be faired, some weight being removed (to be calculated so that Saunterer lies on her lines again), and a watertight joint involving leather and tar created. “As we have stripped back all the paint on the hull we have also discovered three “scribe lines” at different levels (lines scribed by her architects round her hull to show precisely where she should lie on her waterline). 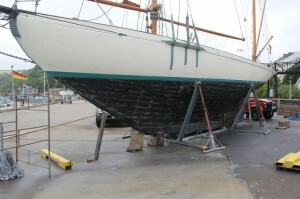 All three scribe lines are lower on her hull than her existing waterline – suggesting that her hull should actually lie further out of the water than it is. 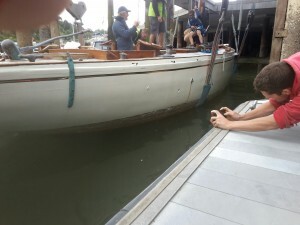 …and when we put her back in the water for a brief floation test to see where she lies on her lines, Saunterer has risen out of the water above her original scribe lines by about 6 inches. 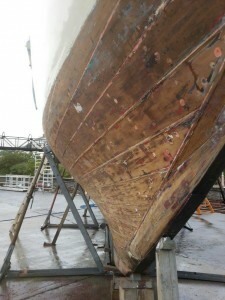 …also shown by the wetted area on her hull as she is lifted out again. 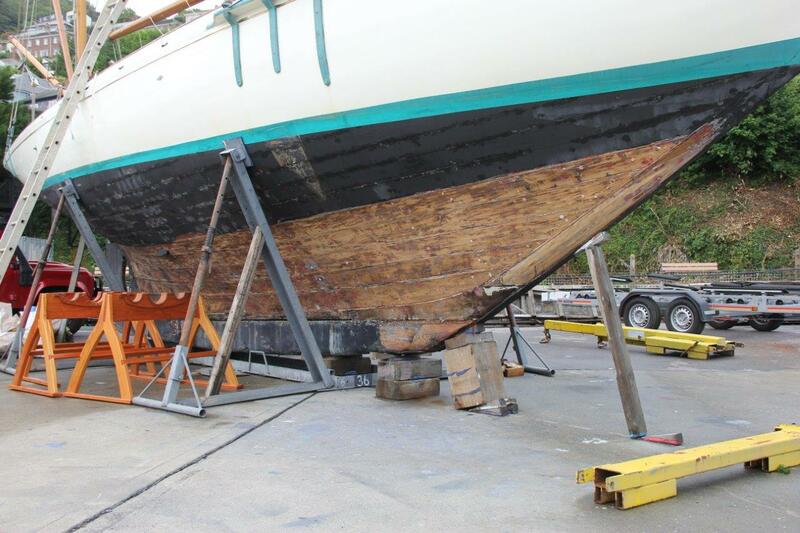 “Unlike almost any other thing, the hull of a wooden boat conceals under its paint many of its secrets – the life of the boat itself. 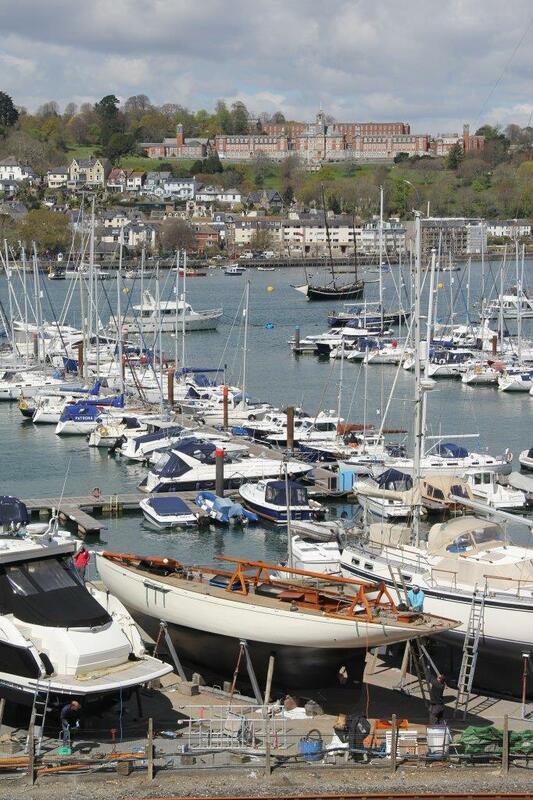 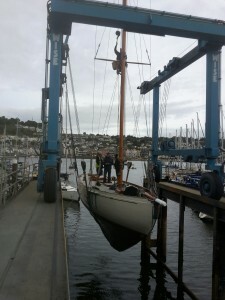 Here in Darthaven Marina in Dartmouth you could be forgiven for thinking this is another wooden hull going through her ritual and necessary upgrading and restoration.